HARRISBURG — Just over a year ago, two women accused the top security officer in the state Senate of sexually harassing them, sending offensive texts or engaging in lewd comments. Within weeks, he had resigned. Since then, both women have filed federal lawsuits against the Senate, claiming the chamber has permitted a culture of discrimination, harassment, and retaliation. One of the two — the second highest-ranking Senate security officer — has seen her duties restricted, and was even given a week’s suspension without pay recently because she let her husband, also a state employee, park in her state-issued parking spot. The sexual harassment case involving the Senate’s security force was just one of several such scandals to envelop the Capitol in the wake of the #MeToo movement, a nationwide reckoning over how women are treated in the workforce that spawned a push to enact stronger protections for victims of harassment. Yet Pennsylvania’s legislature — reeling from #MeToo allegations against three lawmakers — has not taken a floor vote on a flood of bills introduced since the start of 2018 to combat sexual harassment. One of the only measures that did pass was a resolution to create a task force to study the problem. The task force, according to legislative aides, doesn’t even have members yet. The lack of movement has also frustrated those bringing allegations of harassment and even assault. State Capitols across the country have found themselves at the center of sexual harassment scandals since the #MeToo movement challenged women to speak openly and loudly about unfair treatment — and in case after case, unwanted attention and blatant harassment — in the workplace. Some states have ushered through reforms. Pennsylvanialegislators, primarily Democrats, introduced more than two dozen bills aimed at addressing a range of issues. Severalwould have curbed retaliation against people filing harassment complaints. Others would have streamlined the complaint process or barred legislators from using taxpayer money for settlements. In the end, the Republican-controlled state House passed two resolutions: the one establishing the still-to-be-empaneled task force, and another that called for the Joint State Government Commission to examine the scope of sexual harassment in government offices. That review is on track to be completed by mid-2019. The new, 203-member legislature that takes office next month is projected to have 64 women — up 15 from last session. Pennsylvania will rise from 38th to 34th in the nation in terms of female representation in the legislature, according to preliminary statistics from the National Conference of State Legislatures. Supporters of stronger protections hope more female representation could help fuel action. The Capitol was abuzz starting a year ago, first after state Sen. Daylin Leach (D., Montgomery) was accused of unwanted touching and making inappropriate comments — a characterization he disputed. Then the Inquirer and Daily News and the Pittsburgh Post-Gazette reported that House Democrats had secretly settled a complaint against state Rep. Thomas Caltagirone (D., Berks). Weeks after that, two women — the GOP political consultant and Republican State Rep. Tarah Toohil of Luzerne County — filed a complaint with House Republicans alleging that Miccarelli had physically or sexually assaulted them. Both Caltagirone and Miccarelli denied the allegations. Toohil got a three-year protection-from-abuse as part of a negotiated settlement with Miccarelli in which he admitted no wrongdoing. Late last week, the district attorney in Dauphin County who investigated the Miccarelli allegations announced that he was closing his inquiry without charges, after consulting with the second accuser. While the allegations changed the tenor of conversation in the Capitol surrounding harassment, they didn’t lead to a consensus on a legislative agenda. And some question whether there will be movement on #MeToo bills in the coming year. They note that the legislature will still be run by the House and Senate Republican caucuses, which are widely expected to be more conservative in the wake of last month’s election. And the response by GOP leaders so far has been lukewarm. “There are always things that we can take a look at in the changing environment, but we have to do it as a collective, or in a way that is not reactionary but rather is thoughtful and will truly improve the working environment, as opposed to being a political statement,” said Jennifer Kocher, spokesperson for Senate Majority Leader Jake Corman (R., Centre). Pennsylvania is not alone in its relative gridlock. The National Women’s Law Center, a Washington-based nonprofit that has advocated for greater harassment protections, counted more than 100 bills introduced in state legislatures seemingly as a result of the #MeToo movement. Its analysis focused only on a narrower set of bills, such as ones intended to refine the rules surrounding nondisclosure agreements, mandate harassment training, or extend protections to larger classes of workers. Bills passed in 11 states. Delaware, New York, and Vermont extended harassment protections to more employees. Arizona passed a measure permitting people with nondisclosure agreements to speak to law enforcement or during some criminal proceedings. Other states, such as Illinois and Maryland, passed new measures for monitoring harassment. There seemed to be few common threads among the states that passed bills. In some states, the legislatures were controlled by Democrats. In others, they were run by Republicans, or the chambers were split. Other state legislatures refined their internal rules for reporting harassment or sought to study the scope of it. “A lot of legislatures this session spent time internally trying to clean up their own house,” said Andrea Johnson, the center’s senior counsel for state policy and one of the lead authors of its analysis. Others are less sanguine, noting that some issues that arose during the #MeToo movement are not easily solved. 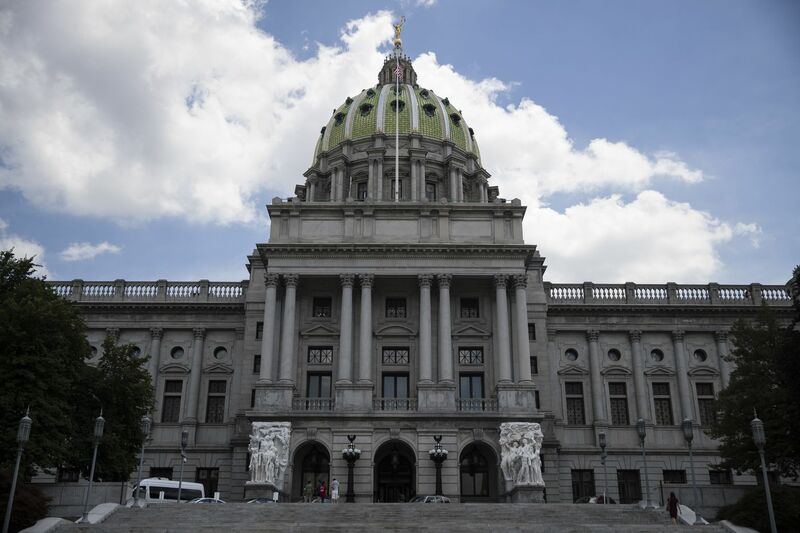 Republicans in Pennsylvania have raised concerns that some bills, such as those pertaining to nondisclosure agreements, could have unintended consequences. “We had heard from victims' advocacy groups that they don’t like the blanket banning of nondisclosure agreements because then it forces people to testify and takes away some of their options,” Kocher said. The two women who alleged harassment by the Senate’s onetime top security officer, Justin Ferrante, feel like their professional lives were derailed after reporting the behavior, according to sources familiar with their cases. One of the accusers, Keah Tingler, a veteran receptionist, has said that the stress of the last few years caused her to have a nervous breakdown. She left the Senate this year. The other woman, Sue Salov, is the Senate security force’s second-in-command. She and her lawyer, Wayne Ely, have declined comment. But sources familiar with her case say that over the last nine months, she has been stripped of some duties and access and given a poor evaluation for the first time in her decades-long career. Adam Santucci, a McNees Wallace & Nurick lawyer whose firm was hired by the Senate to investigate harassment complaints, said he could not discuss internal personnel or disciplinary issues. Victims' advocates say many men and women who report harassment or assault find themselves professionally isolated and emotionally strained. The political consultant who accused Miccarelli, the onetime state lawmaker, said she felt she was fighting the system. In her statement, she described it this way: “Sexual violence is not and cannot be considered the ‘cost of doing business’ for a woman in politics."